"Reader: You will be TRANSFORMED BY INJURY—vicariously and literally as you read this book of poems. "There is a message in this poetry that is poignant and essential for all who are recovering from traumatic brain injury and for those who love them. This poetry will transform you: Mind, Body and Spirit. You will feel your skin prickle; your heart and lungs open and your mind relax in a way that prose would never penetrate. You will become aware of the greater importance of your Life experience, transformed by injury. You will know the stages and transitions that occur on the healing journey with Traumatic Brain Injury. You will experience a wakeup call mentally and spiritually to declare the purpose of your life. As you read A Life Interrupted, you will be interrupted to become more authentic and whole, while wholly different than before. "This book should be required for every neurologist graduating from residency. It should be in every VA hospital for soldiers returning from war. It should be at the bedside of all who suffer at home. A caretaker should gently read these words out loud to heal and be healed. "The book not only outlines the TBI journey but specifies resources for healing. The best of the best therapy and therapists in this country are listed at the end of the book. These approaches hold hope for all who have chosen this challenging and difficult life in transition. To those who work with TBI and those such as Louise Mathewson who live beyond it, we owe our gratitude and awe." Linda W. Peterson-St. Pierre, Ph.D.
of shock and confusion onto one of hope and possibilities. “Brain injured individuals are launched into a journey through unfamiliar and chaotic terrain, a path with few signposts and one mostly traveled alone. Many enter that wilderness and do not return. Louise Mathewson has traveled that path. Yet, remarkably, she has refused to surrender to its isolation. Through her poetry she insists that we join her there as she wrestles with the angel of transformation, as she emerges from the cocoon of her grief to become the shimmering poetic butterfly so evidently here now. What emerges through her writing is an evocation of the experience of brain injury that is by turns wrenching, detailed, clinically accurate, ruthlessly honest, and in the end spiritually rich and nourishing. “This is not necessarily an easy book to read. Much of it is about the peculiar qualities of suffering and distress that happen to people following a traumatic brain injury. This is not the breezy, Hollywood version of life we are so accustomed to, where bad things never happen to good people. Here is the voice of a good person, and something quite bad has clearly happened. Louise refuses to let herself or us off the hook too easily. ‘You must look at this,’ she seems to be saying; ‘this is real and it’s not okay to ignore it.’ So we must accompany her on the journey of her personal tragedy and ultimate transformation. 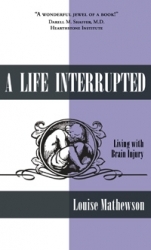 "Louise eloquently relates the experience of a brain injury into such poetic prose. 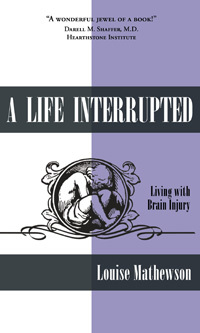 Through her analogies, she conveys what it must feel like to live with a brain injury. Her words soothe me."